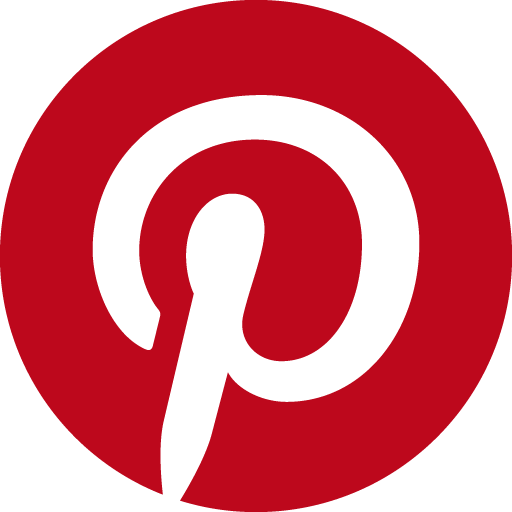 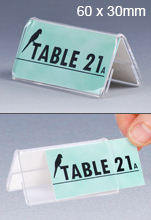 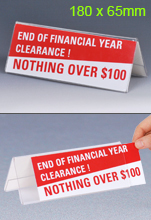 Tabletop Signs are Made from Acrylic to be Lightweight & Easily Cleaned! 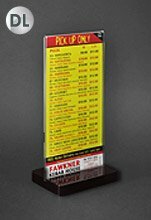 The different tabletop signs that we offer make it easy to provide information to patrons at your business in single location. 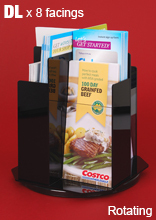 This line of table menu stand options all hold multiple graphics in order to have heaps of information available to visitors from a single stand without taking up too much space on the table, counter, bar top, or desk! 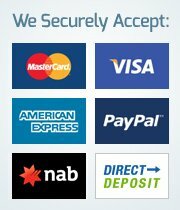 The various types of styles that we offer make it easy to communicate sales specials, product information, new menu items, train timetables, cocktails, and other offerings to waiting customers. 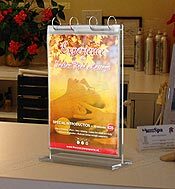 This style of display is very popular, and can be found in restaurants, pubs, cafes, retail stores, transit stations, office lobbies, casinos, hotels, bakeries, travel agencies, hostels, and so many more! 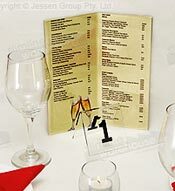 The tabletop signs include a series of menu rolls that make it easy to place plenty of information regarding standard items as well as specials, cocktail selections, and more right on the table with patrons! 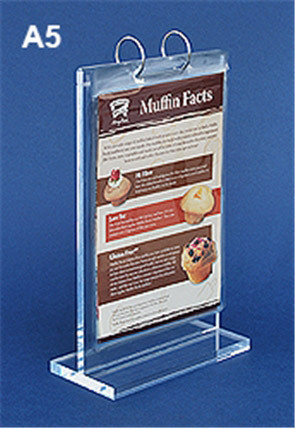 These displays feature a clear acrylic stand to easily match any décor, with the solid base helping to ensure the display is stable. 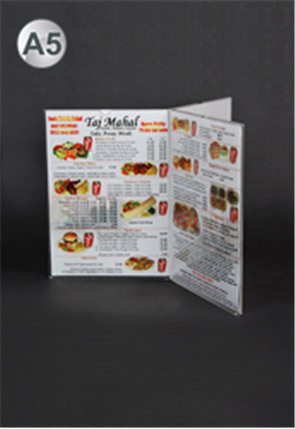 Each table menu stand includes vinyl sleeves to hold your graphics in, with different sizes able to be held depending on which stand you purchase. 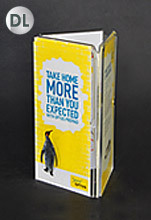 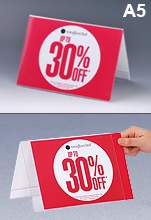 These sleeves are each able to hold two graphics back-to-back in order to maximise the amount of information provided. 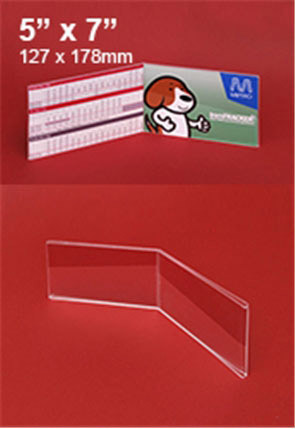 By utilising vinyl sleeves and an acrylic display, these table stands make it easy to clean after each guest in order to maintain a hygienic environment! 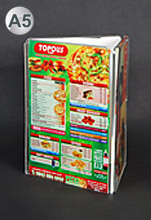 Metal rings at the of the menu rolls easily unclasp in order to remove the sleeves for graphic change-outs, with posters easily sliding into these holders. 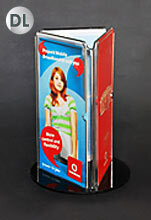 The flip stands make a great addition to any restaurant or bar to provide their menu choices to patrons. 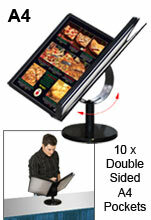 In addition to the menu rolls, we also offer many types of rotating displays with multiple faces to hold information. 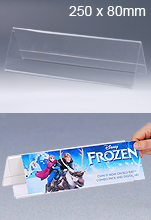 These displays feature acrylic holders that allow you to slide-in graphics for quick poster changes that take less than one minute with no tools required. 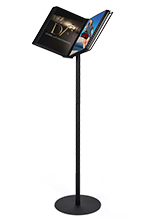 There are different sizes able to be held in the stands, including DL, A4, & A5 standard sizes posters that are in portrait orientation. 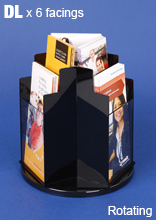 These stands have an acrylic base that swivels, allowing patrons to easily switch sides of the stand to read all the available information. 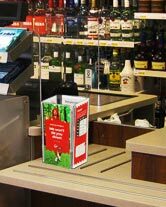 As mentioned above, using an acrylic display makes it easy to keep a hygienic environment with cleaning not damaging the displays! 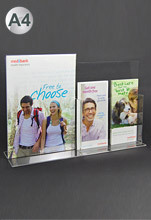 Aside from offering different sizes in the selection, there are also different types to choose from, with both 3-sided & 4-sided options The small footprint of these displays allows them to be placed onto counter-tops or bars without taking up too much space whilst still providing heaps of information to customers. 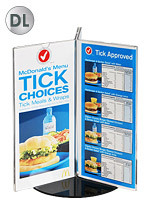 There are also poster stands that are able to hold your graphics straight-up, making it easy to show advertisements, timetables, and more in a variety of location. 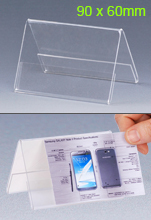 Combining a solid base with clear acrylic holder ensures a durable display that will easily work with your business to inform customers of information in a stylish manner. 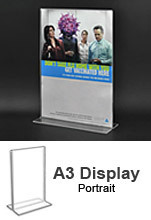 One of the newer offering we are provided are bi-folded acrylic displays that are also able to be single or double-sided depending on how you wish to display posters in your business. 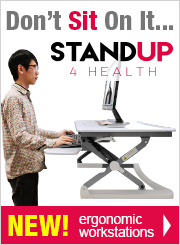 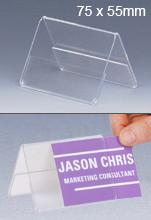 There are multiple sizes available, allowing you to easily pick which stand is more appropriate for use at your business. 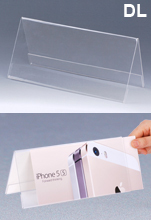 These clear acrylic displays have polished edges to maintain a professional look, and the 3mm clear plastic means you get a durable display that will last for years to come in heavily-trafficked environments. 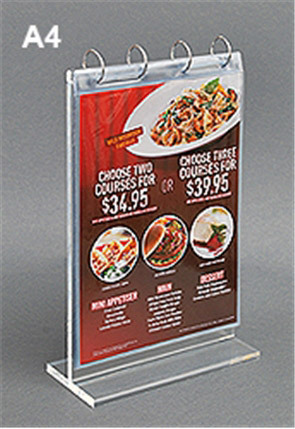 Our large selection of different types of holders for tabletops makes it easy to find the appropriate holder for use at your business! 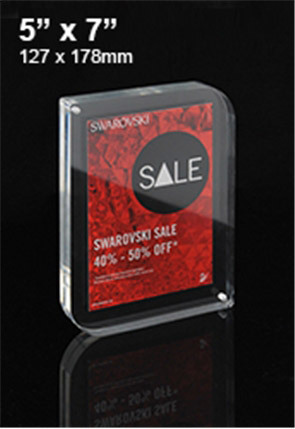 There are various types of displays to choose from in many categories, with our huge selection of acrylic products making it easy to purchase high-quality displays at a low price. 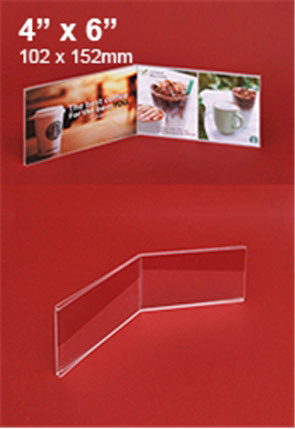 This selection of products includes many different types of clear acrylic displays, with a wide assortment of brochure holders & business card holders available, as well as various donation boxes that may also be used for comments or suggestions in the office or at retail stores, restaurants, cafes, and pubs! 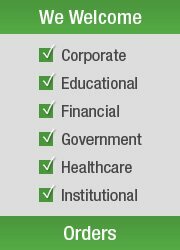 With so many options to choose from within this category, it's easy to find the right product that will work for your needs. 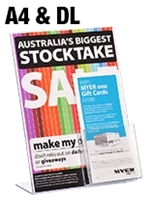 Click here to access our extensive online catalogue, with hundreds of products in a wide variety of categories allowing you to outfit your business from our single location! 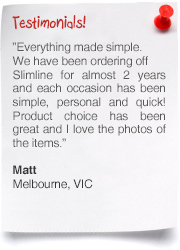 We add new products to our selection weekly, helping to stay current with the latest trends, technologies & styles as well as keep your business (& ours) ahead of the competition! 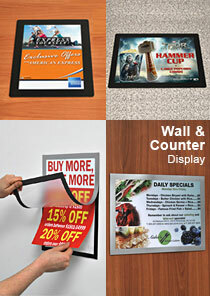 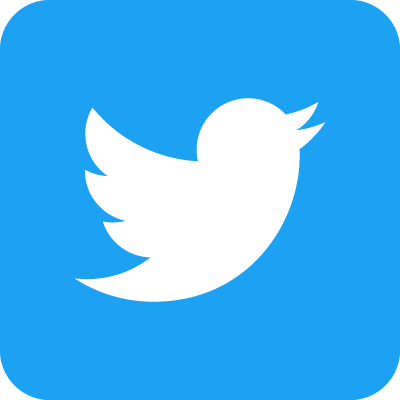 Check out all we have to offer, including light boxes, noticeboards, TV stands, brochure holders, cafe barriers, hanging hardware, real estate displays, pavement signs, lecterns, A-frames, photo frames, hospitality displays, POS sign holders, stanchions, table throws, and so many more! 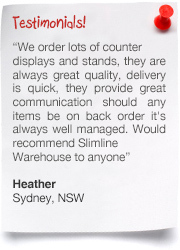 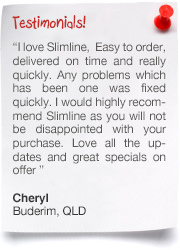 With over 20 years experience in the business, Slimline Warehouse offers a huge selection of different products that have been cultivated from our research with items from vendors around the world. 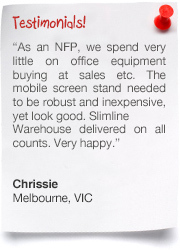 We test each & every product before allowing our customers to purchase, ensuring you are only able to buy high-quality products, all available at low prices that have made us a national leader in POP, POS, retail, & trade shows displays! 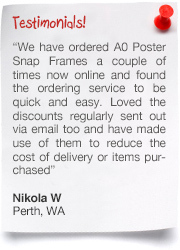 Despatch is provided from our warehouses same day with most in stock items that are purchased by 1pm EST to anywhere in Australia, including Sydney, Melbourne, Canberra, Hobart, Adelaide, Bendigo, Alice Springs, Toowoomba, Darwin, Perth, Gold Coast, Newcastle, Cairns, & Brisbane! 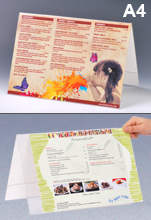 Order today for your business!